Why the country's reaction to the Middle East revolts has been hopelessness and malaise. Every night for a week and a half, I stayed up until four in the morning in my Moscow hotel room, watching Egypt’s glorious revolution. It was a routine prompted partly by a bad case of jet lag, but mostly by captivation with an uprising that appeared to have acquired its own unstoppable momentum. Yet, during the days, which I spent talking with Moscow intellectuals, experts, entrepreneurs, journalists, and opposition leaders, I had the eerie sense that I was watching the Egyptian tape rewound, back to a time before the protesters took over Tahrir Square. This feeling of déjà vu was summarized best by the superb Novaya Gazeta, Russia’s only remaining national opposition newspaper. Wasn’t Russia also “corrupt, technologically backward, slow, huge, ineffective and repressive?” it asked on January 28. In case the reader missed the point, the January 31 issue of the paper highlighted in yellow this passage in an analysis of the Egyptian unrest: “The clan which is settled on top of the power pyramid only ‘lets out steam’ to lower the pressure by imitating elections. The electoral process is distorted (parties prevented from registration, the ‘unwanted elements’ banned from mass media) and the results of people’s voting are invariably falsified.” The paper’s op-ed page editor and leading columnist, Andrei Kolesnikov, described “Tunisian Syndrome” in terms that were equally applicable to his native land: the corruption that stems from unchanging, unaccountable authorities; “stability” that becomes indistinguishable from stagnation. And yet, while there was plenty of empathy with Egyptians, there were no mass protests. Instead, Russian disquiet has assumed other, less hopeful forms. I was in Moscow as the elite was assessing the Putin decade, and never before have I seen such dejection. The despondency stemmed from the consensus, almost uniformly held, that the political and economic model that Vladimir Putin offered—stability in exchange for Kremlin-controlled “sovereign democracy,” sustained by government controlled oil- and gas-driven growth—is nearly bankrupt. Instead of the security that the Kremlin promised, there is unprecedented corruption, rapacity, and, increasingly, violence. Nearly 70 percent of small business owners in Moscow report paying bribes. Police venality and brutality are a daily national nightmare; violent crime has soared, including gang wars and execution-style murders in broad daylight. Chechnya has been “pacified”—and is now a brutal dictatorship toying with sharia governance. The Muslim fundamentalist insurgence has spread to previously quiet Dagestan, Ingushetia, and Kabardino-Balkaria, while the Moscow Metro, planes, and an airport have been the targets of devastating terrorist attacks. Meanwhile, although the economy seems to have emerged from a devastating crisis, it is far from healthy. “Economic growth based on oil has been exhausted,” Russia’s Finance Minister Alexei Kudrin stated bluntly in early February. Yet no other model has emerged to dislodge raw commodities from their place as the foundation of the national economy. Large sums of capital continue to flee—much of it, troublingly, belonging not to the oligarchs but to Russia’s middle-class entrepreneurs. Perhaps the most bitter blow for reform-minded Russians has been the complete failure of Dmitri Medvedev to deliver on his promises of a more open and lawful society. So vast has been the gap between his rhetoric and his deeds that the intelligentsia now seems reluctant to give him even the benefit of the doubt. The Kremlin is once again the proverbial black box, from which emanates a stream of often meaningless and occasionally bizarre simulations of state business. 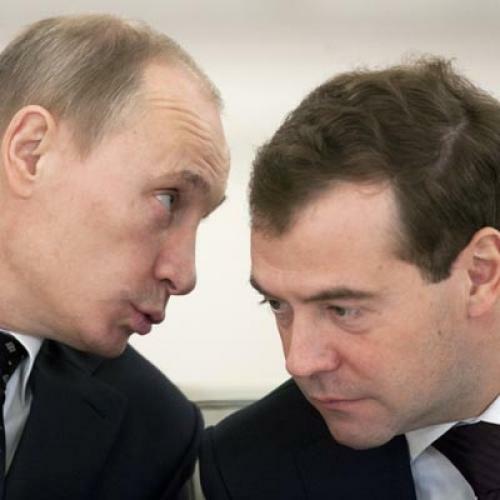 The goal of this “imitation politics,” the editor of an elite political journal told me, is to keep everyone off balance and to ensure that neither member of the Putin-Medvedev “duumvirate” looks like a lame duck ahead of the 2012 “elections.” Thus, Medvedev’s most recent ukases have changed “militia” to “police,” cut the number of Russia’s time zones from eleven to nine, and ordered observance of daylight-saving time year round. Putin comments on everything: from the Russian film industry to air guns and what subjects should be required in school. Plus, of course, his fitness regimen, which he shared with the supermodel Naomi Campbell in an interview for British GQ. Instead of revolting at this state of affairs, however, many Russians are leaving. According to the official statistics, 1.25 million people have emigrated from Russia in the past few years. Unlike the two most recent waves of emigration—the Jewish and dissident migration in the 1970s and the exodus of the early 1990s that was spurred by the economic dislocation of the Soviet collapse—those leaving today cannot be written off as either potential or real fifth columnists, or people who are abandoning the Motherland for sausage and blue jeans, as the expression goes. Today’s emigrants are mostly younger, educated, urban, and middle class or business owners. In a survey on the website of Novaya Gazeta, the largest number of respondents thought the migration was due to Putin’s likely return to the presidency. The emigrants are also said to be searching for educational and professional opportunities, to be afraid of terrorism, and to be tired of the harassment of corrupt government functionaries. A leading Russian economist, Vladimir Mau, has called the departure of the elite the biggest problem that Russia faces today. There may be an even more troubling sign of Russia’s malaise. In December, a violent riot broke out among nationalist soccer fans on Manezh Square, next to the Kremlin. The trouble began after an ethnic Russian young man was shot and killed in a brawl in Moscow with North Caucasians, who have flooded the city in search of work and to escape their virtually ungovernable region. As Lilia Shevtsova, one of the most astute and courageous observers of Russian politics has pointed out, this was a revolt by the “Putin generation”—those who came of age in the 2000s and were reared on patriotism, anti-Westernism, and virulent anti-Americanism, thanks to Putin and his echo chamber on national television. Yet, in the end, this high-protein nationalistic diet has failed to breed contentment. The soccer fans rioted, Shevtsova concludes, because of an “intuitive feeling of the hopelessness of the future.” Their angry outburst, it is worth noting, was a very different matter than the mostly peaceful push for democracy in Egypt. And the Russian authorities’ initial confusion and fear, followed by clumsy attempts to balance threats and pandering, suggest that the Kremlin’s ride on this tiger is getting increasingly precarious. This year, a deeply divided Russia is preparing to mark the twentieth anniversary of the demise of the Soviet Union, an event that either marked the birth of a free, post-totalitarian country or “the greatest geo-political catastrophe of the twentieth century,” as Putin would have it. For many of my interlocutors, Tahrir Square was a painful reminder of the exhilaration of August 1991, when hundreds of thousands of people demonstrated in virtually all the largest cities against a hard-line military coup. Among those I spoke to, there was an acute sense of the long road that must be traveled in order to reach a sustainable democracy, even one that is far from perfect—a road that has so far been strewn with missed opportunities and marked by many dead ends. The distance of two decades had also brought an understanding of the 1991 revolution’s greatest flaw: the attempt to construct a democracy on a shallow foundation. Seventy years of totalitarianism had sunk deep into Russian soil, and the country lacked a strong civil society capable of self-organization in defense of a fragile democracy perennially in danger of degradation and subversion by authoritarian urges in the national political culture. To Russian liberals today, there is no lasting salvation in a Tahrir Square-style outburst, no matter how fervent the pent-up passion for freedom may be. Their only hope for Russia seems to be one that may take many years to realize—bottom-up, grassroots social movements that would instill in hundreds of thousands of Russians a personal sense of responsibility for one’s life and that of one’s country. Until then, a free, prosperous, and democratic Russia will remain a dream—a kind of Baba Yaga hut on flimsy chicken legs, planted only a few inches into the ground. Leon Aron is director of Russian studies at the American Enterprise Institute. His book about ideas and ideals that inspired and shaped the 1987-1991 Russian revolution will be published by Yale University Press this year. This article originally ran in the March 24, 2011, issue of the magazine.